A lovable litter of puppies, an enchanting London setting and animation's most flamboyant villainess all add up to 101 Dalmatians, one of Disney's all-time greatest Classics! The fun starts the moment Dalmations Pongo and Perdita settle into their owners' flat to become proud par... read full description below. A lovable litter of puppies, an enchanting London setting and animation's most flamboyant villainess all add up to 101 Dalmatians, one of Disney's all-time greatest Classics! The fun starts the moment Dalmations Pongo and Perdita settle into their owners' flat to become proud parents of 15 precocious pups. It's one big happy dog family - until the outrageous Cruella De Vil kidnaps the puppies, along with every other Dalmatian in the city! Now it's up to Pongo and Perdita, using the magic of 'the twilight bark,' to reunite the entire animal population in a thrilling mission to help the courageous pups outsmart their evil captor. 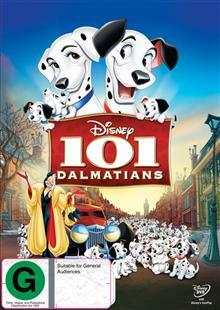 Bring home all 101 Dalmatians and rediscover the excitement, the love and the laughter of this timeless Disney treasure!